Fabulous bottlebrush-like brightest red flowers in late spring and summer - stunning detail on each strand. A magnet for bees and butterflies when in flower - they need attracting to our gardens to pollinate food crops. This standard form on a clear stem looks great in a big pot, on the patio. A hardy shub, it overwinters down to -4C, so give protection in colder, windier spots. Supplied as a 80-100cm (incl pot) tall standard lollipop-form tree in bud in spring. 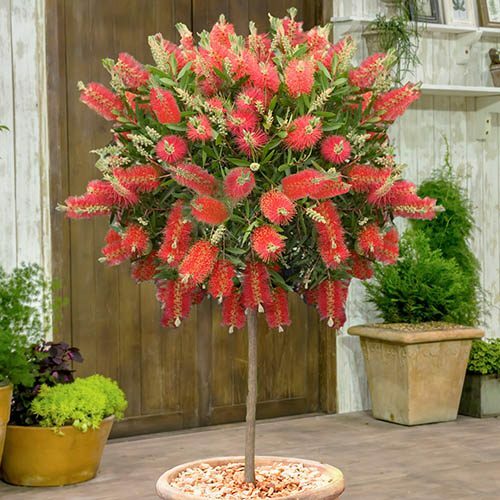 Callistemon is a simply beautiful evergreen tree that will explode with incredible firework-like bottle brush blooms in early summer each year - the flowers are larger than many other varieties. Available here in eye-catching ‘standard’ form so the flowering head is held on a strong stem, well above your other plants, thereby making an incredible visual statement and making your garden really stand out from the crowd! They are perfect for growing in pots on your patio and to make them even more attractive, the foliage has a refreshing lemon-citrus scent that will fill the air when you brush past or crush the leaves. Friendly insects and essential pollinators will flock to the nectar-laden blooms, ensuring that your fruits and vegetables get the essential ‘pollination service’ they require! So even if you are a Grow Your Own gardener with little need for flowering plants – there is no excuse here! Originally raised in Kings Park in Perth, Australia and very commonly grown across the Mediterranean, these complete beauties have incredibly pretty pink foliage when it is young and are surprisingly winter hardy here in the UK down to -4C! In very exposed sites, a fleece cover will see them safely through the winter. They love a sun drenched position and will reward you with more spectacular blooms when you site them well. Supplied approx. 80-100cm tall including pot.